The Handbook for Girl Guides or How Girls Can Help to Build Up the Empire is the full title of the book more commonly known as How Girls Can Help to Build up the Empire. 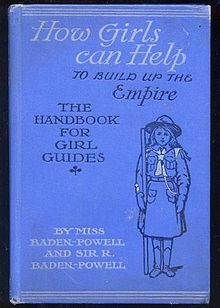 It was the first handbook for Girl Guides. The author was Agnes Baden-Powell in conjunction with (then) Lieutenant-General Sir Robert Baden-Powell. It was published in May 1912 by Thomas Nelson and Sons. The book was a reworking of the famous Scouting for Boys. It was adapted for use by girls, although large sections remained unaltered and it included sections on stalking, tracking, signalling and camping. Several chapters on childcare, nursing and housewifery had been inserted and stories of heroic women and girls were sometimes substituted for the male ones. The book also contained the enrolment ceremony and details of the second- and first-class tests. Mitchell, Pat (July 17, 2006). "Scouting and Guiding Books". Retrieved 2006-10-03. "Fact Sheet - The Three Baden-Powells: Robert, Agnes and Olave" (PDF). Girl Guides of Canada Guides du Canada. Archived from the original (PDF) on October 7, 2006. Retrieved 2006-10-03. Magyarody, Katherine (2016). "Odd Woman, Odd Girls: Reconsidering How Girls Can Help to Build Up the Empire: The Handbook for Girl Guides and Early Guiding Practices, 1909–1918". Children's Literature Association Quarterly. 41 (3): 238–262. doi:10.1353/chq.2016.0030.